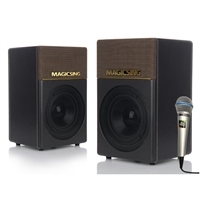 LATEST Addition to Magic Sing - Add to your existing karaoke system for High Fidelity sound quality. * Built in Amplifier Stereo Speaker System - Makes an Excellent Combo with any Magic Sing systems! * Built in Mixer with Echo, Mic Level, Line Level, Bass, Treble, and Master level dial controls. One Wired Microphone, Stereo Active Speakers(one pair), Speaker Cable, AC Power Adapter (100-240V 50/60Hz) w/ U.S. type socket, User Manual and Warranty Card.